Don't do it. That's the rule. So simple. 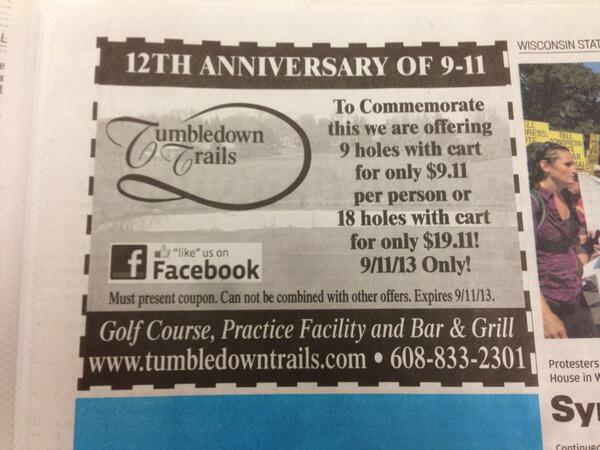 Don't offer a $9.11 golf special. Don't tweet a picture of your product framing the ghostly lights of Ground Zero. Don't offer free coffee and mini muffins for 30 minutes. Advertising is hard. This is easy. 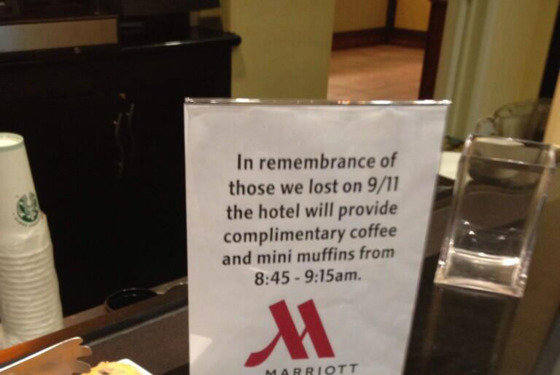 Don't use a national tragedy as a news peg for your product or service. "Sorry for the deaths of 3,000 people, please give us money for something unrelated" is the polar opposite of clever adjacency. It is always offensive, and it never works. This is not a winnable challenge for copy writers. On a day when most Americans are enveloped by visuals and memories of a horrible, horrible day, companies would be well-advised to adhere to the converse of "never forget." Please, marketing departments of America: Stop trying so hard to make us remember.